This bank holiday weekend, why not bake a classic Easter Simnel cake? We are giving Bookends Mary Berry’s recipe, from Fast Cakes. Happy Easter! Bestselling author Adele Parks lets us know what she gets up to at Easter…and why she thinks an Easter Bunny delivering eggs makes NO sense! I love Easter, it’s full of everything that makes me (and most of us) smile: family get-togethers, budding trees, plants and flowers, the first hint of sunshine and chocolate! OK, let’s not over-romanticise things here; I’m fully aware that the extended family around the table means there will be squabbles (but I always try to remember they are loving ones), budding plants and trees are also accompanied by the obligation to spend an afternoon cutting the grass and pulling weeds, and chocolate – well, it’s a guilty pleasure. But, honestly, I can’t see a drawback to sunshine. I like what we are celebrating: rebirth, hope, second-chances, peace. Easter is a fantastic holiday, a minimum of two days off work for most of the grown-ups, two weeks off school for kids. I remember childhood holidays with huge affection. When my son was younger we did all the traditional things. He and his cousins painted boiled eggs and then rolled them down the hill to see whose would break first, I hid chocolate eggs in the garden and we even made Easter bonnets. I’ll admit he never had much enthusiasm for this tradition – it is a bit girly, but my nieces were keener. Easter this year is a little more restrained. He’s studying for his GCSEs and so our family, like thousands of other families up and down the country with kids tied to their desks, won’t have the luxury of slipping away for a week or so. I urge those of you who don’t have this constraint – make the most of it! Go somewhere warm and fabulous, dip your toes in the water, eat fat olives (they look a bit like mini eggs), have your Easter egg hunt on a beach, sip wine on a balcony. Sigh. I am a tiny bit envious, I can’t deny it. We’ve come up with a 3-course meal plan full of delicious treats for you to enjoy this Easter weekend. Let us know if you try out any of the dishes! And if you’re not planning to cook a full meal, scroll down for a very chocolatey treat. This soup tastes like pizza, in a good way. Greek basil has small green, oval, pointed leaves, which pair deliciously well with tomatoes for all the flavour without the FODMAPs. You can use regular basil too, but Greek is more robust and holds up better in the oven for extra flavour – buy in the fresh herbs aisle from any big supermarket. Preheat the oven to 200°C (gas 6). Halve the plum tomatoes, deseed and quarter the peppers and cut the parsnips into small chunks. Place in a roasting tin, drizzle with the basil-infused oil and sprinkle with a handful of basil. Roast for 40 minutes, turning halfway through. Add the roasted veg to a large saucepan, along with the vegetable stock. Simmer on a low heat for 10 minutes, then season, add 2 handfuls of basil and blitz with a hand-held blender or pour carefully into a blender or food processor and blitz. Adjust seasoning to taste and serve. Emma’s book, based on her hugely popular food and lifestyle blog She Can’t Eat What?! will take the frustration out of living with IBS, Crohn’s disease, coeliac’s disease, food intolerances and many other digestive disorders. It is for anyone who suffers from bloating, tummy pains, digestive issues or feelings of heaviness and discomfort, and for anyone who wants to feel healthy and happy after eating. The best way to celebrate the arrival of lamb in the spring is to serve it with other ingredients that come into season at the same time, in this case, Jersey Royal potatoes, asparagus and peas. You could use fresh peas for the purée, but as frozen peas are frozen within hours of being picked, they are considered just as fresh if not fresher than unfrozen ones. Preheat the oven to 200°C/180°C fan/Gas 6. Season the lamb rumps with a little salt. Heat the olive oil in an ovenproof frying pan over a high heat until very hot, then brown the rumps for 2–3 minutes on each side, until well caramelised. Transfer the pan to the oven and roast for 8–10 minutes, until the lamb is cooked but still pink in the centre (or cook for 15–20 minutes, if you prefer well done). Remove from the oven and leave to rest for at least 5 minutes before carving into slices. Keep warm. Meanwhile, make the pea purée. Put the spinach into a large heatproof bowl. Pour boiling water over to cover and leave for 30 seconds, just until wilted. Immediately drain and cool quickly under running cold water. Squeeze out any excess water, then pat dry on kitchen paper and roughly chop the spinach. Put the peas into a saucepan, pour over the hot stock and simmer until tender, 3–4 minutes. Drain well, reserving 100ml of the stock, then blitz the peas and reserved stock in a blender or food processor with the spinach, mint and butter, to make a purée. Season to taste with salt and pepper (you may not need salt as the stock is quite salty). Keep warm. While the peas are cooking, blanch the asparagus in a separate large pan of boiling water for 2–3 minutes, until just tender. Drain, immediately refresh in cold water, then drain again well and pat dry on kitchen paper. Heat a griddle pan until it’s very hot and then drizzle in the vegetable oil. Add the blanched asparagus to the pan (you may need to do this in a couple of batches, depending on the size of your pan) and cook over a high heat for 2–3 minutes, turning once, until charred all over. To serve, put a spoonful of the pea purée onto each plate, then sit the lamb slices on top and drizzle with beef jus. Arrange the griddled asparagus alongside, then serve with crushed minted Jersey Royal (or other) new potatoes. 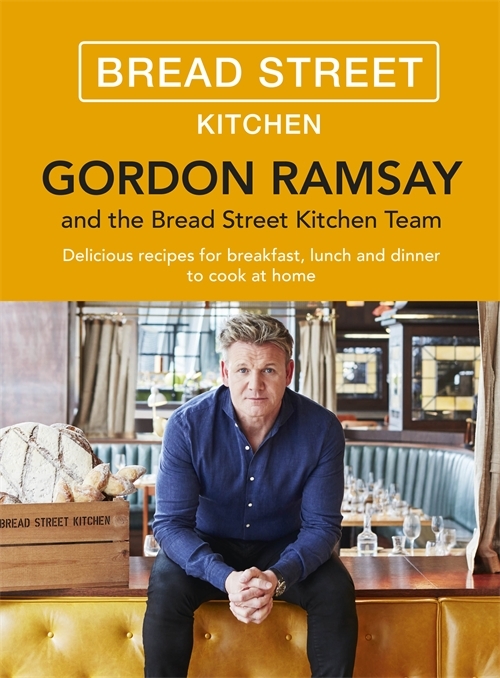 From breakfast to dinner and everything in between, this is a collection of 100 fresh new recipes from Gordon Ramsay and the award-winning team at Bread Street Kitchen. Like the restaurant itself, the book is all about relaxed and sociable eating, using fresh ingredients, simple techniques all delivered with the signature Gordon Ramsay stamp so that you know it’s going to be good. Can be made up to 24 hours ahead-decorating with raspberries and icing sugar before serving. Not suitable for freezing. If you don’t have cooking rings, you can use small empty chopped tomato or baked bean cans. Take off the top and base with a can opener and wash thoroughly. This mixture can also be made in a 20cm (8 in) shallow springform tin. Watch out -there is now a low-fat condensed milk available. If you use this, it won’t set! Line a baking sheet with cling film and sit 8 cooking rings (7cm/2-3/4 in) on top. Crush the biscuits with a rolling pin until they are fine crumbs. Melt the butter in a pan and add the crumbs and sugar. Stir until combined. Using a teaspoon, press biscuit crumbs into the base of each ring to give an even layer. Transfer to the fridge to firm up while making the filling. Measure the mascarpone and condensed milk into a bowl and whisk with an electric hand whisk until smooth. Add the lemon juice and curd and nearly all the lime zest (reserve some for decoration) and juice and whisk again until thick and creamy. Spoon on top of the biscuit base in the rings. Level the tops, cover with cling film and chill for a minimum of 2 hours. Run a palette knife around the inside edge of each ring to help ease the cheesecakes out on to individual plates. Decorate with the reserved lime zest and some raspberries on the side, if liked. Sunday lunch is one of the great British traditions and who better than Mary Berry, Queen of the Kitchen, to bring together the classics and her own family favourites to create an invaluable all-year-round cookbook. Full of reliable and delicious recipes to suit cosy informal meals and show-stopping feasts for friends. Mary brings Sunday lunch right up to date and in addition to top tips for the classic roast she shares her springtime starters, autumnal fruit pies, slow-cooked casseroles and light summer salads – plus of course divine desserts, too. An invaluable addition to every kitchen shelf. 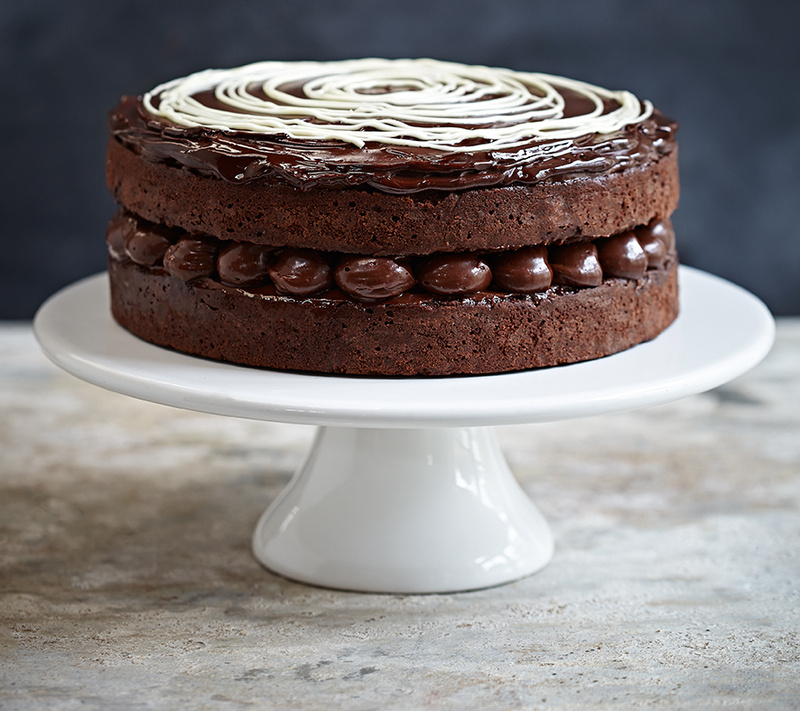 This hazelnut chocolate cake is inspired by our Dizzy Praline chocolate, a firm favourite ever since the first Hotel Chocolat store opened ten years ago. This recipe uses ground hazelnuts combined with dark chocolate to recreate the smooth and seductive taste of praline. A straightforward type of chocolate is best for this recipe, so choose a house blend. Preheat the oven to 180°C/gas 4. Grease 2 x 18cm round cake tins and line with baking parchment. Melt the dark chocolate for the cake in a bowl set over a pan of simmering water, stirring occasionally, for 2 minutes. Make sure the bottom of the bowl doesn’t actually touch the hot water. Alternatively, melt the chocolate in a microwave, stirring every 10 seconds or so to ensure the chocolate does not burn. Using an electric mixer, beat the egg whites until they form soft peaks. Carefully fold the ground hazelnuts into the egg whites. In a separate bowl, beat the egg yolks and sugar until thick and pale, then mix in the melted chocolate. Add the egg white mixture to the chocolate mixture and fold gently to combine. Divide the batter equally between the prepared tins and bake in the centre of the oven for 20 minutes, or until the top is firm to the touch. Allow the cakes to cool completely in their tins before turning them out. Sandwich the cakes together with the chocolate spread. To make it a showstopper, pipe on the spread for a beaded edge and smooth it over the middle. Melt the dark chocolate for the topping. as above, then quickly beat in the cream using a whisk, until smooth and glossy. Spread over the top of the cake. Melt the white chocolate in the same way as the dark chocolate, making sure it isn’t hotter than 30°C, and then pipe a swirl of the melted white chocolate on the top of the cake. Leave to set before serving. Chocolate is one of our most popular ingredients – both to eat and to cook with. But how many of us know how truly versatile it is? Hotel Chocolat, the UK’s leading chocolatier, has pioneered ‘cocoa cuisine’: a new way of cooking with chocolate because, although we know chocolate as a sweet ingredient, cocoa was originally used in savoury recipes. This perfect book for Easter includes energy-boosting recipes for breakfast, savoury recipes that enhance meat and fish dishes as well as give texture and depth to salads and snacks. And of course, not forgetting the hedonistic qualities that we love so much – with seductive bakes and puddings for all tastes. Feeling fed up of chocolate already? Here’s a recipe for a delicious and different Easter cake from Lynn Hill’s The Clandestine Cake Club: A Year of Cake . A traditional Simnel cake has a thin layer of marzipan baked into the centre and is decorated with a circle of marzipan on top. This cake is a little different because it has 11 marzipan balls baked within the cake! It also has the unusual addition of pistachios (and adorable Easter chicks!) – This recipe was provided by the members of the Leeds CCC. Preheat the oven to 170oC/fan 150oC/gas mark 31⁄2. Grease and line a 20cm round, springform cake tin. Place all the dried fruits, mixed peel, sugar, butter and juice in a large pan. Bring to a simmer slowly, to melt the butter and sugar, then simmer for 10 minutes on a low heat. Remove from the heat, transfer to a large bowl and leave to cool. Once cooled, add the eggs and pistachio nuts and stir until well combined. Add the flour, baking powder and spices and mix until thoroughly combined. Divide the marzipan into 11 pieces and shape into balls. Spoon just less than half the cake mixture into the tin and arrange the marzipan balls evenly around the mixture taking care not to let it touch the sides of the tin. Spoon the remainder of the cake mixture on top and smooth out. Bake the cake in the bottom of the oven for 1 hour or until a skewer inserted into the centre comes out clean. Leave the cake in the tin to cool completely. For the topping, gently warm the jam in a small saucepan. Take 50g of the marzipan and roll it into a large ball, then roll out the remainder and cut out a circle the same diameter as the cake. Cover the top of the cake with warm jam and place the circle of marzipan on top. Place your large ball of marzipan in the middle, using a little jam to help stick it down. Decorate the cake as wished.